Miles Supply’s FREE CUT ONE cutting Diamond blade with segments 25mm tall! Free-Cut-One Our improved blade is easy-cutting and the diamonds last longer because of our new infiltration process. Modernizations on the segment & notch geometry improve cutting performance; during normal wear, as segment height decreases, the active cutting surface increases to compensate. Friction is reduced by notches drawing away sludge. These designs account for an extraordinary diamond cutting experience and the highest standards in blades. Fast, precise, long-life, and quiet! Compare this to Zenesis…. 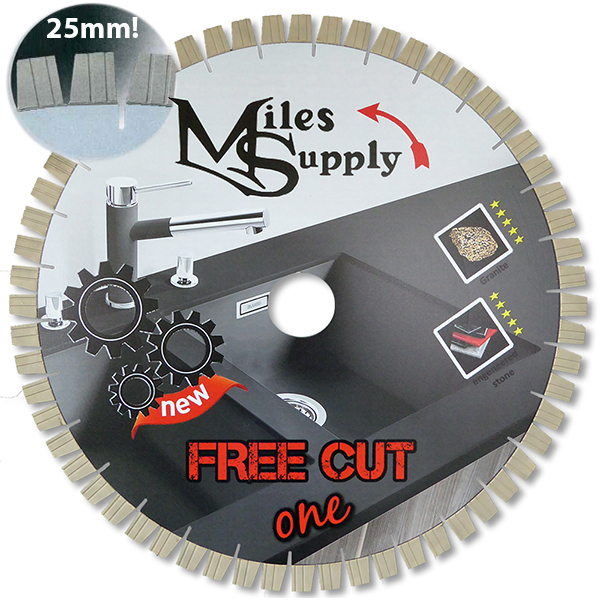 Here’s Miles Supply’s version for your countertop needs! Great cutting speed and blade life. Increase your productivity while reducing the stress on your saw.